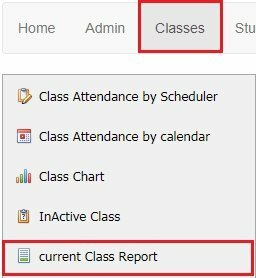 Current Class Report will give you updated class information such as current number of students enrolled, day/time of class, teacher, venue etc. Click on Classes at the top. To the left click on Current Class Report. This will pull up current class information from your defaulted school season. You can sort and search for classes in the grid. You can also export to a PDF or export into Excel to print.